BONPLAND, Argentina , Dec 26 2014 (IPS) - Summers in northeast Argentina are hot and humid. At siesta time, the people of this rural municipality like to drink “tereré” (cold yerba mate), which until now they had problems preparing because of lack of clean water or electricity. But sometimes small donations can make a big dent in inequality. Andrés Ortigoza, who lives in one of the villages in Bonpland, proudly shows off his simple new solar panel, which heats up an electric shower. In wintertime, tereré is replaced by hot yerba mate – a caffeinated herbal brew popular in Argentina and neighbouring countries – and taking a cold shower is not easy even for toughened gauchos (the cowboys of the Southern Cone countries) like him. “We used to wash up with cold water, it was tough in winter….or we’d heat the water with firewood,” he told IPS. Picada Norte, where Ortigoza lives, was not connected to the power grid until 2010. But service is still patchy and is expensive for local families. The installation of solar water heaters is one of the projects financed in Bonpland by the Global Environment Facility’s (GEF) Small Grants Programme (SGP). With its non-repayable grants of up to 50,000 dollars, the SGP has shown how small community initiatives have a positive impact on global environmental problems. The expansion of forestry activity – mainly aimed at providing raw material for the pulp and paper industry – and the use of firewood as a source of energy are driving deforestation in the jungle in the province of Misiones, which accounts for fully half of Argentina’s biodiversity. The area forms part of the eco-region of the Parana basin tropical moist forest, which takes a different name in each country that shares it: Brazil, Paraguay and Argentina. “At an international level, talking about these three countries, there were 80 million hectares around 1950, of which only four million hectares of forest are still standing today, and of them, 1.5 million are in Misiones,” Juan Manuel Díaz, the provincial sub-secretary of ecology, told IPS. “Our province covers three million hectares and practically half of that is Parana jungle,” he said. According to Ricardo Hunghanns, president of the Tabá Isiriri-Pueblos del Arroyo Association, 45 percent of productive land in Misiones is currently used by the forestry industry, which since the 1990s has changed the traditional distribution of land and modified the provincial economy. “This has radically transformed the structure of agriculture in the province, where the paper industry rather than agriculture now represents 80 percent of GDP,” the head of the organisation, which is involved in two SGP projects, told IPS. In Bonpland, the association is trying to do that through the projects financed by the SGP. But it first has to work out basic questions of subsistence. Sara Keller suffered from not having water for 45 years. Every day she went to the nearest stream, one km from her village, to haul back 20-litre buckets of water, whether she was pregnant or carrying one of her six children. Calculating the total, she walked over 20,000 km in her life, to fetch water. But now the 52-year-old married mother of six and grandmother of five, who lives in the village of Campiñas, has running water in her home, thanks to a simple five-km pipe financed by another SGP initiative. “I really suffered not having water, carrying it from far away in the dry season,” Keller, who now has free time to care for her vegetable garden, sew and even rest, told IPS. One of the goals of all SGP projects is to include a gender perspective. Women are often reluctant to take part in meetings because, due to cultural questions, they don’t like to express opinions in front of their husbands, said Hunghanns. But, he pointed out, it is women who establish the priorities for the projects. That was the case of the project that replaced latrines with toilets. 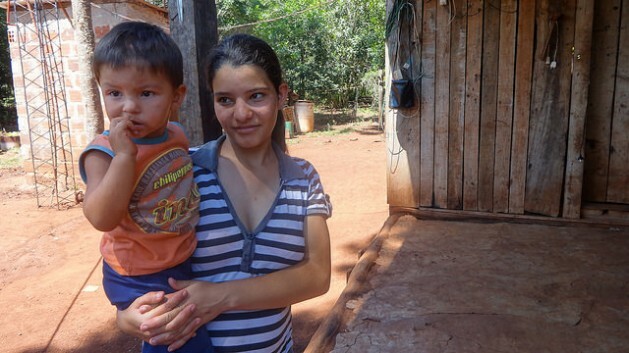 Soledad Olivera, 18, whose husband is a rural worker employed in the extraction of sap or resin, and who has a two-year-old son and is expecting her second child, is happy with the new bathroom in her house in Picada Norte, which replaced a “dirty, smelly latrine”. “It’s so nice,” she says with a big smile on her face as she looks at the bathroom, complete with a toilet, electric shower, and, especially, running water. The SGP, implemented by the United Nations Development Programme (UNDP), is financing 20 projects in Misiones, which also include the care of water sources, sustainable agricultural development, ecotourism activities with Guaraní indigenous communities, waste management and the production of medicinal herbs. “The term ‘small donations’ [the translation of small grants in Spanish] isn’t the best. Because it’s a commitment between two sides. We contribute something, and so do the community and the grassroots organisations,” said René Mauricio Valdés, the UNDP representative in Argentina. In return for the aid, the recipients – whether individuals or institutions – provide labour power, training or machinery (in the case of municipal governments). In Argentina, the SGP is involved in 52 projects in the provinces of Misiones, Corrientes, Entre Ríos, Formosa, Santa Fe and Chaco, for a total of 1.8 million dollars in grants. Diana Vega, a representative of Argentina’s Secretariat of the Environment and Sustainable Development, explained to IPS that the SGP was not hurt by the global drop in development aid. “We staked our bets on this programme because change at a local level is essential for generating real change,” she said.